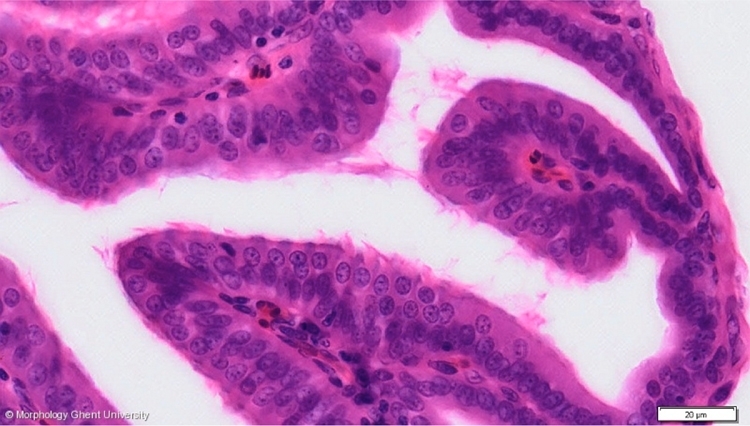 The lining epithelium of the tubus infundibularis is a simple ciliated cilindric epithelium with goblet cells. On HE as in the micrograph above, groups of cilia are visible and the basal bodies are visible as a dark line. Goblet cells are difficult to recognize. The infundibular glands (glandulae tubi infundibularis) are located in the depth between the plicae (fossae glandulares infundibuli). Here, the epithelium looks a bit swollen and there are no cilia or basal body line.